The card base is just a piece of yellow cardstock with a layer of dp from Echo Park Paper's Beautiful Life collection, and finished with a piece of white cardstock embossed with an older Cuttlebug folder. A simple piece of ribbon was wrapped around the embossed paper before it was adhered to the card front. The adorable image is one of three included on the Whimsy Stamps Happy Birthday to You set available here. 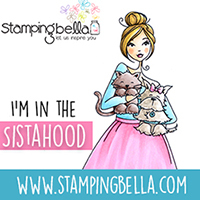 Be sure to check out the wonderful prize that you could win just by entering a birthday themed card in One Crazy Stamper's monthly challenge. We are also looking for guest designer's for the coming months, so please check out all of the details here.